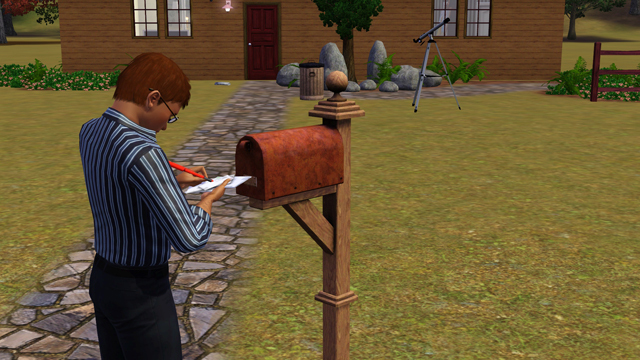 So…I installed University Life and actually played through a term with Rafael Ribeiro (I’ll post it soon). I actually interrupted William Austin’s play session to try it out, because I wanted to make sure that it worked with my mods, etc.. After playing through that term with Rafael and seeing how it works and reading up on it from various Sim forums and pages, I think I know how I can make it work with my timeline. In my hood, I try to play each family for 4 Sim days, with each day representing approximately 1 week. So, I play as if each time, I’m spending a month with the families. I will have to play the Sims at university a little differently, because they are on a very different timeline. I am only ever going to send them to uni for 1 week (you can pick between 1 and 2 weeks), and I think that week usually begins on either a Saturday or Sunday. For my purposes, each week spent at uni is going to equal a semester–which is really more like 3 or 4 months. As a result, I think the updates for university students will usually only take place twice a Sim year–once for the Fall semester and once for the Spring semester. Other families might get to have two or three updates in a Sim year, but since the week-long Sim term is supposed to represent so much time, it makes sense to only have them twice. Another thing I’ll have to remember to do is have the Sims take the fewest credits possible each term. This is to help the terms mirror the real world, where university degrees take several years to complete. 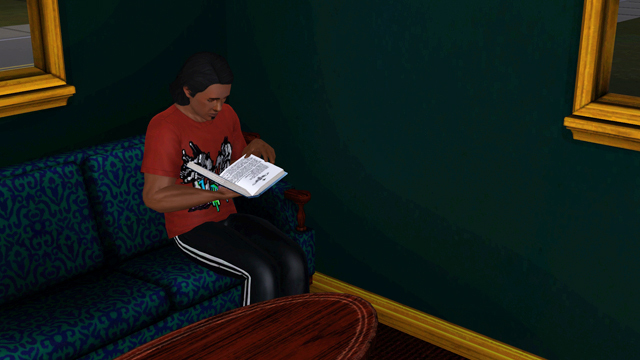 Two terms/semesters attended should equal one academic year–so my Sims will usually need to attend 8 terms/semesters so that their degrees take about 4 Sim years to complete. The degrees offered by the university take 48 credits to complete, and I think there is an option to have students take only 6 credits. If they have a lot of skills, then we can pretend that they earned some early college credit in high school–so it would make sense for those Sims to finish early. I will still have a community college in Plymouth Falls for associate or technical degrees, and those will take less time (depends on whether they are just certificates or if they are full two-year degree plans). Finally, I’m planning to create a university household in Plymouth Falls, as a kind of holding area so that I can send sets of students to college together. That’s one of the biggest drawbacks of this system in University Life–as far as I can tell, you can’t send students from separate households to university at the same time. They have to be in the same household for that to be an option. I don’t think I’ll get to test this out until I send Claudia to college in Fall 2014. With playing Rafael for a semester, I’ve already messed this system up for him a bit. I had him take 12 credits (I think) and he had some credit built up because of his skills. I’m going to pretend that he enrolled in summer college to try to make up some credits, since I wrote him as having flunked out of university after his first semester. It makes sense to me that he’d try to get back in and get some credits under his belt, since he would feel like he was behind. Well, that’s pretty long-winded, but I wanted to explain how I plan to handle the university system, both for interested readers but especially so that I can go back and look at this myself if I forget! 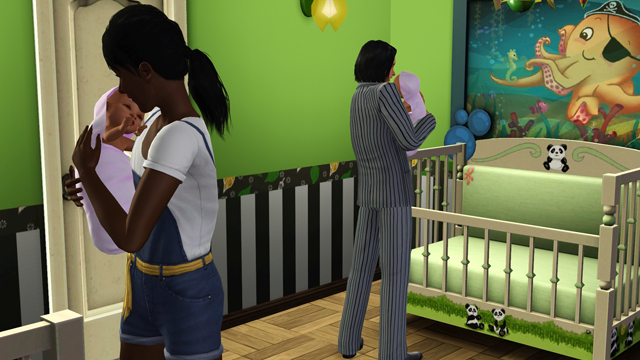 The Sawada household had been pretty busy for the last three months, since the birth of the triplets. Katie and Mizuto had spent most of their free time seeing to the needs of their new babies. They were just now starting to get the hang of the whole parenting thing and falling into a workable routine. 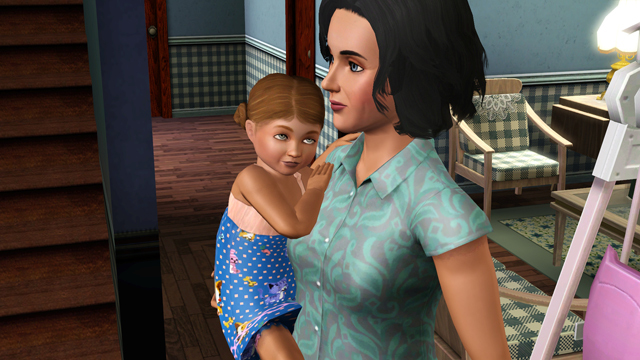 The Parras are delighted with how cute little Carmen has turned out. The little one just joined the ranks of the toddler age-stage. 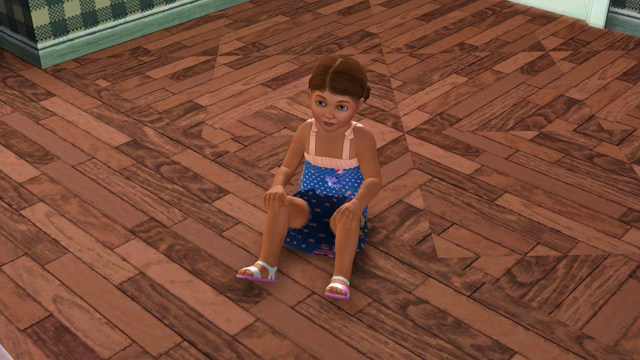 She seems to have inherited her father’s eyes and hair color, and her mother is excited about the new ways that she can play with her little girl. I age infants to toddlers at 10 months old (40 days). Isn’t she cute?